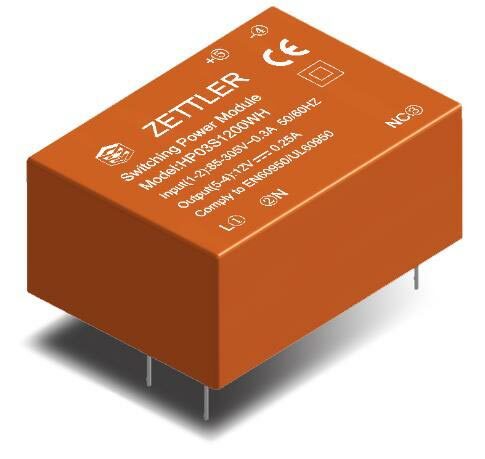 ZETTLER Magnetics expands Line of Switch-Mode Power Supply Modules | ZETTLER MAGNETICS, INC.
Company introduces High Performance SMPS series and patent-pending Zero-Cross features. Aliso Viejo, CA, USA/Xiamen, China/ Hong Kong/Munich, Germany – April 4, 2017 – ZETTLER Magnetics announces the expansion of its successful line of AC-DC switch-mode power supply modules (SMPS) by introducing a special high-performance series. In addition to the well-established benefits of the regular Zettler SMPS series that include easy plug-and-play, compact encapsulated design, universal input range, and ultra-low power consumption, the high performance HP series will feature extra wide ambient temperature capability, and an extended life time of MTBF> 1 million hours. The HP series will initially be available for 1W-3 W output power, with various output voltages, and an extended input voltage range of 85VAC-305VAC. A special subset of the new HP series, the ‘X-Series’, features a patent pending zero-cross detection and monitoring capability, which supports increased efficiency of power Thyristor circuits and extended component life time, e.g. for relays, if switching occurs at zero-crossing. In addition, certain sensing applications, such as those found in the ‘smart home’ market, require the elimination of 50/60 Hz noise which the zero-cross feature can help accomplish by synchronizing built-in A/D converters with the mains frequency.